Seeing how we haven't been to Memphis Blues in awhile, I made it a point to go there sometime soon. I needed to treat Snake Eyes to a meal since he always seems to be there whenever I need something. This included helping me by climbing a 25 foot scaffold at my old place for renovation purposes. If it were me, it would take much longer or not at all. So tonight, Viv and I took him and his wife to the original location of Memphis Blues BBQ on Broadway. 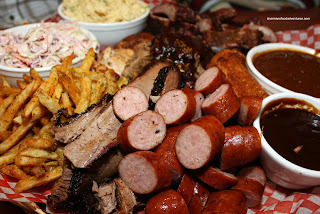 When we used to live in Downtown, I'd pick up the Memphis Platter all the time as take out. Vegetarians we are not! That was enough for 4 people easily. However, it seems like the portion size has shrunk and only seems enough for 2-3 people. Whatever, that's what the Elvis Platter is for! Twice as big and at $69.95, I find this massive plate of meat a good value. I can see why Tony Roma's is not longer operating any locations in the GVRD anymore. Sure, it's a different type of BBQ; yet it's close enough. We could never get out of Tony Roma's without spending $20.00+ each. Memphis Blues is a very casual place. You order from the counter, grab your own drinks, plates and utensils. However, they do bring the food out for you. Thank goodness for that because I'd probably drop the Elvis Platter if I had to do it myself. Look at the thing! You got brisket, pulled pork, ribs, sausage, rib tips, a whole BBQ chicken, fries, cornbread, slow cooked beans, coleslaw, potato salad and housemade BBQ sauce. This is a fabulous value for $69.95. Remember, there are hardly any fillers on this plate! 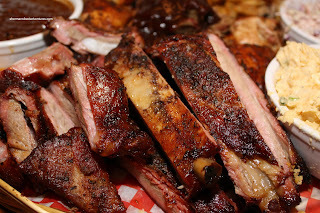 Now, if you're not a big fan of dry BBQ where the meat cooks in its own juices at low heat for a very long time, this may temper your enthusiasm. I'm still not completely a big fan of their ribs since I find them a bit dry; but this is how its supposed to be. I dunno, call me blasphemous; but I prefer the boiled, then BBQ'd ribs you'd find at Montana's. A personal preference really. Otherwise, the rest of the meats are tender and go well with the smoky BBQ sauce. The sides are alright, nothing mind-blowing. If eaten in the restaurant itself, the fries are crispy and well seasoned. Bring them home and they become a soggy mess. The crunchy coleslaw needs more zing in my opinion and the potato salad is not bad. 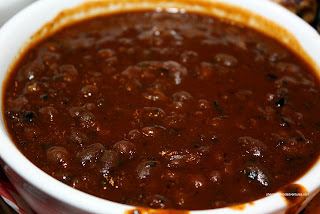 I really like the beans, there are bits of meat residing in the smoky, sweet sauce. It ain't perfect; but in Vancouver, there is little in the way of Southern BBQ. And at the prices they charge, I believe Memphis Blues is the place to go if you get the BBQ meat cravings. Hey, you might want to try Burgers Etc. in Burnaby. 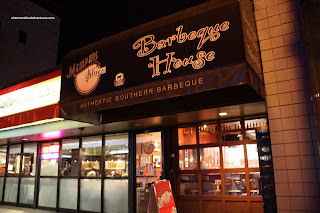 It has been over a year since I ate there, but I liked it a lot - I also found Memphis Blues ribs to be too dry. Thanks for reminding me Doug. I originally visited Burgers Etc. a while back and only had their burgers. I've been meaning on returning for their BBQ items. I keep forgetting! I swear they must do something more to their fries - it's almost like they've been tossed in a bit of garlic butter or something equally delicious! Yes, they are good (when fresh, like any other fry). Seasoning salt plus something else. Not sure about the something else. Better not be butter! One of my most memorable meals when visiting Vancouver was here. Plus, who doesn't love a meal that can get a bit sloppy!